Railroads transported commuters greater distances, such as Ashland-Richmond and Manassas-District of Columbia. Starting in the 1880's, electricity-powered street car systems stimulated suburban development, allowing workers to live on the edge of cities and commute to work daily. With the development of automobiles and public funding for paved roads, the suburbs grew dramatically in the 1900's. Bus systems replaced streetcars, and as commuters switched to personal cars, the for-profit bus companies got out of the business in the 1930's-1950's. Some private bus companies simply disappeared, while others were acquired by local jurisdictions and operated as a public service. Population growth after World War II and Federal funding for highways led to expansion of the suburbs and ever-greater traffic congestion in Hampton Roads, Richmond, and Northern Virginia. The search for solutions led to creation of Metrorail in the DC area, the Virginia Railway Express (VRE) commuter railroad in Northern Virginia, plus The Tide light rail system in Hampton Roads. 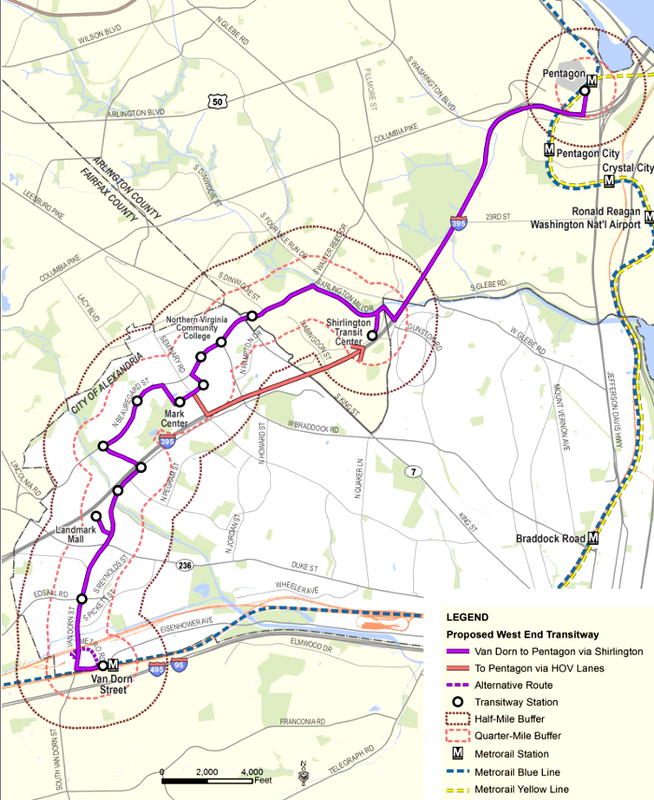 The cost of rail-based transportation led to a seach for alternatives, and the decision to use Bus Rapid Transit (BRT) in Alexandria, Arlington, and Richmond. Virginia Beach also considered a BRT link from Town Center to the Oceanfront. The city dropped plans to extend The Tide light rail system from Norfolk to Town Center in 2016 after a public vote rejected the proposal, and without the light rail connection to Town Center the plans for a BRT extension to the resort area on the waterfront also died. BRT systems are designed to mimic rail systems, with tickets purchased in advance before boarding the bus. Bus platforms are level with the bus itself, eliminating the steps required to board from traditional curbside bus stops. Most significantly, BRT routes use dedicated lanes to bypass traffic congestion. BRT vehicles resemble passenger rail cars and create the impression of a premium transportation service suitable for middle-class passengers, in contrast to the reputation of local buses being the transportation system for the poor. The buses are powered by internal combustion engines; unlike light rail and old trolley systems, no unsightly overhead power lines are required. The primary advantage of BRT systems over light rail is that construction costs are lower. The primary advantage of BRT systems over traditional bus systems is that BRT vehicles reach their destination faster than traditional buses trapped in traffic on regular highway lanes, thanks to the special lanes used only by BRT vehicles. Richmond is planning a 7.6 mile Broad Street Bus Rapid Transit project, creating a new transit route from Rocketts Landing on the eastern edge of downtown to the West End shopping center at Willow Lawn. By using three miles of dedicated BRT lanes, built parallel to the existing Broad Street, passengers using the BRT line would travel one-third faster, at 13mph rather than 8mph. That speed would save 14 minutes per trip from end-to-end, assuming any residents in the new apartments/condominiums built on the eastern edge of downtown needed to travel to Willow Lawn. The choice of BRT technology in Richmond reflected both physical contraints and basic objectives for the project. The trolley network built in the 1880's demonstrated clearly that Richmond's hilly topography was not a barrier to a rail transit system, but 130 years later there was no room available on the city's congested street network for a light rail line. 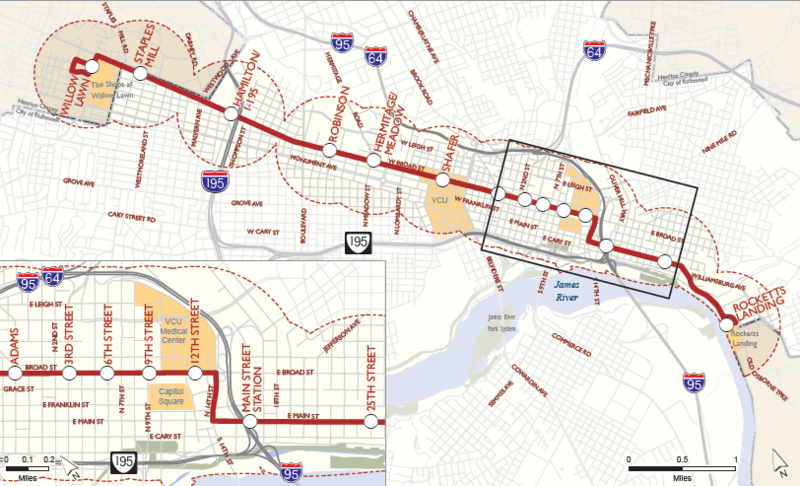 The other alternative was expansion of the Glenside Express Bus service, which would be the most cost-effective way to reduce commuter-generated congestion on I-64 between downtown Richmond and the West End suburbs. However, improving that transit service would provide no land use benefits. Limiting the BRT system in Richmond to primarily the city, with just the Willow Lawn station in Henrico County and the Staples Mill station on the city/county border, minimized regional politics and eliminated any need to negotiate with Chesterfield County. Richmond, Chesterfield, and Henrico are part of the Richmond Metropolitan Authority (RMA), which focuses on toll roads and excludes bus service from its portfolio. Arlington and Fairfax counties in Northern Virginia rejected the option of a BRT system on Columbia Pike, but Alexadria adopted the BRT approach for the West End Transitway.